After graduating from Simon Fraser University with a Bachelor of Arts degree in Commerce, Vic became vice-president of a family run sawmill in Vancouver that employed 200 people. In 1988 the sawmill was sold and he then became the chief pilot and operations manager of a helicopter charter operation, which he ran until the later 1990’s, after which he devoted full time to trading. Up until the early fall of 2005 he was employed by a large futures brokerage house in Vancouver, and has since left that job to concentrate exclusively on trading foreign exchange for his own account, and most importantly to help others find success in trading. Vic has always maintained a passion for trading and as a result of his years in the brokerage business was able to gain unique insights into the habits of both successful and unsuccessful traders. It was the unsuccessful traders that really challenged Vic to want to make a difference, and so to that end he has now embarked upon a strategic relationship with Forexmentor.com with the sole purpose of helping people develop successful trading habits. 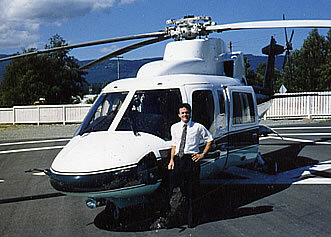 "In the above picture you see me standing beside an aircraft that I was lucky enough to fly, a Sikorsky S76 helicopter. You may not realize it but there are some very definite similarities between trading and piloting an aircraft. Specifically, just as you must go through a pre-flight checklist for flying, you need to have a check list for trading before you ever leave the ground (make a trade), and you must know your destination (exit point) as well as how to handle emergency procedures (a stop loss). And then there’s the actual “in-flight” information that is crucial—trade management. Chances are that if you keep crashing and burning then your checklist is flawed (or non-existent). And you should definitely not be piloting an aircraft! I have found that there is a tremendous consistency in both winning and losing traders in how they handle their checklists! If you are confused about your checklist or, worse yet, you don’t really even have one, then maybe you should consider participating in our personal mentoring session program. The Forexmentor team that Peter Bain has assembled is extremely impressive, and I am very honored to be a part of it. Having met the entire team I can tell you that you have become involved with an extremely hard working, honest and dedicated team that works very hard to help traders achieve success. We are all very fortunate to have someone like Peter who is so totally passionate about seeing people reach their trading goals." Vic operates the twice-weekly live training and follow-up service called the Coach's Corner and the Recurring Forex Pattern Daily Review service. » Read more about Vic Noble.